RSD 2019 release. 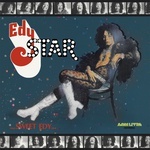 Edy Star's debut LP, Sweet Edy (1974), is one of the key cult albums from 1970s Brazil, never reissued on vinyl until now. Still remembered by many for being one of the members of the Sociedade de Gra-ordem Kavernista, the psychedelic and vaudeville project created by Raul Seixas in 1971, Edy Star is an artist whose work has broadly covered very diverse fields: visual artist, actor, singer. In 1974, and with only two recorded singles, producer João Araújo invited him to record a full-length album, possibly excited by his participation in the Seixas project some years earlier. Edy then called upon his friendship with a large number of local talented composers and asked for songs by Gilberto Gil, Caetano Veloso, and Erasmo Carlos. When he received the song that would open the album, "Claustrofobia", a composition by Roberto and Erasmo Carlos, it was accompanied by a copy of an LP by Kool & The Gang to show what kind of rhythm should accompany it. So, despite the clearly "glam" feel that the cover of the album might suggest, the LP starts off with some astonishing funky brass arrangements that evoke very different musical parameters. The album progressively takes one through the swinging vibes of "Briguei Com Ela", the contagious rhythmic guitars of "Edyth Cooper'", the samba jazz with the signature of Caetano in "O Conteúdo", the irresistibly danceable "Super Estrela", to the fuzzy bursts in "Pro Que Der Na Telha", revealing here a piece of a festive work, sounding almost cabaret-like, as well as standing out as work of vindication at the same time, being a pioneer album in expressing gay militancy in Brazil. Despite not being one of the best-known or most sought-after titles in the record label's back catalog, Sweet Edy rivals in quality the best albums released by Som Livre during those years, including songs written by the best Brazilian composers of the time. Regrettably, Edy Star would take decades to return to the studio and release new music after many years living abroad. Featuring glam rock, funk, samba jazz and songs written by the best composers of the time, anyone looking for a Brazilian take on Marc Bolan, David Bowie, or Roxy Music will love this stunning record. Presented in facsimile artwork and pressed on 180 gram vinyl.